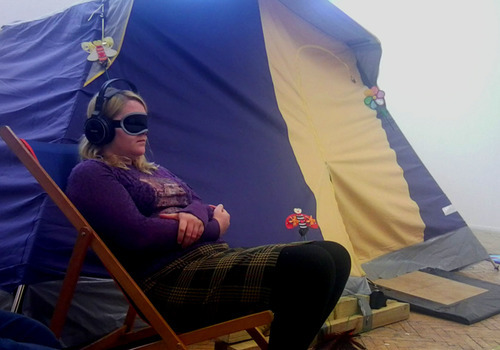 A whistle-stop sensory tour of Britain’s best beauty spots, using tactile and climatic effects, smells and tastes, and binaural soundscapes – all squeezed into a retro canvas frame tent. Please wear headphones so you can hear the binaural soundscapes in this video! This unguided walking tour invites blindfolded visitors to make a solo journey through meadow, mountain, beach and cave, with only a handrail and the sound of unknown footsteps guiding their way. Drawing on communal nostalgia, it recreates an imaginary rural idyll unique to each individual, giving them a hard-earned break from the stresses and strains of modern life.